Ho hum, Salesforce announced its quarterly earnings yesterday and the news was all good once again with revenue up 25 percent to $2.68 billion. The company has blown through its $10 billion yearly revenue goal and has boldly set one for $20 billion by FY2022. I wouldn’t put it passed them. 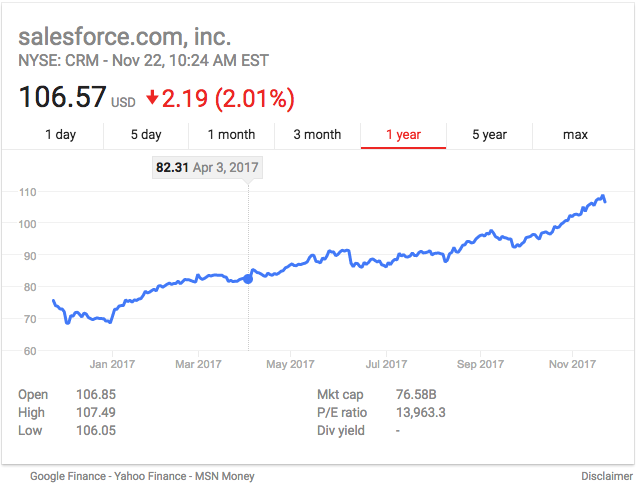 Salesforce is the anti-IBM. While Big Blue has had 22 straight quarters of declining revenue, Salesforce has been on a steady increase over the last several years. The company’s quarterly revenue going back three years to Q32015 has almost doubled from $1.38B to this quarter’s $2.68B. Both moves are designed to bring a new generation of leadership to the company, which should help Salesforce from stagnating or getting too comfortable with its success, but the company does have a lot of presidents with Taylor and Dayon joining Block , CFO Mark Hawkins and Chief People Officer Cindy Robbins all holding that title. President could be the new vice president at Salesforce.